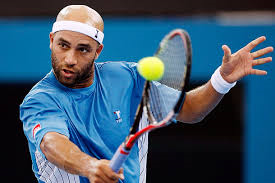 James Blake, once a top-five player in the world, announced on Monday he plans to retire after the 2013 U.S. Open, according to ESPN. A graduate of Harvard, Blake turned pro in 1999 and seven years later had climbed to a career-high No. 4 in the world rankings. Blake has slipped to No. 100 this season. Over his career, Blake reached three Grand Slam quarterfinals, including two in New York, where he lost to Andre Agassi in 2005 and to Roger Federer a year later. He referenced his five-set loss against Agassi as both a highlight and lowlight of his time on tour. “Despite the tears, I’m actually really happy about this,” Blake told ESPN, noting that he looks forward to spending more time with his wife and their 1-year-old daughter. When asked what his future plans might include, Blake told ESPN he would like to serve as captain of the U.S. Davis Cup team and work as a television commentator. Blake’s announcement comes a year after his friend and former U.S. Davis Cup teammate Andy Roddick announced his retirement following the same event. Blake faces Ivo Karlovic in his first-round match.